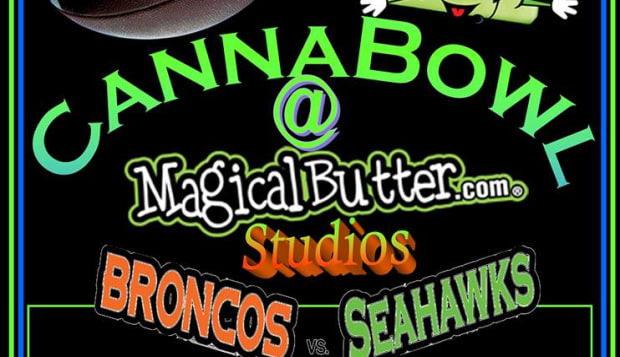 Coincidence or cosmic giggle, both NFL Championship teams competing in this year's Super Bowl hail from cities that have legalized the use of recreational marijuana for adults. How do these two weed-friendly towns stack up? It's a toker's toss up, but all odds point to a high scoring game. First to Market: Denver has kick off advantage. Adults 21+ can legally smoke pot at Super Bowl parties in both towns; but you won't be able to legally buy it in Seattle until late this spring. Denver Pot shops are open, and doing brisk business. Number of Pot Shops: The "Mile High" city once again dominates. 117 stores will sell marijuana products; 29 recreational stores, and another 89 retail/medical dispensaries. In Seattle, a total of 21 retail licenses will be issued, although local pols want more. Weed-Friendly Politicians: The Emerald City's new mayor Ed Murray is progressive and pro-pot. Denver Mayor Michael Hancock opposed legalized recreational marijuana in his city, and wants to crack down on public pot smoking. In Seattle, the city sanctioned a public smoke out underneath the iconic Space Needle to celebrate the first anniversary of the passing of Voter Initiative I-502 legalizing marijuana.